The killing of Chechen separatist leader Aslan Maskhadov will not end resistance to Russian rule in Chechnya, his main envoy has said. Akhmed Zakayev added that a successor would be chosen within days. Mr Maskhadov, who was elected president of Chechnya in 1997, was killed by Russian troops in a raid on Tuesday. He was seen as the most moderate of Chechnya's rebel commanders after distancing himself from a string of terror attacks and calling for talks. Russian television broadcast pictures of the 53-year-old's half-naked corpse, lying in a pool of his own blood. Mr Zakayev, who is based in London, said: "The resistance will continue, no doubt about it." A "military committee" would choose a successor to Mr Maskhadov. "This committee has the power to name a successor to Maskhadov, and that decision will be legitimate until elections can be held. "The announcement will be made in the next few days." Mr Zakayev added: "Aslan Maskhadov will be much more dangerous for the Kremlin leadership in death than he could have been even in life, when he was calling for peaceful dialogue. "It is a very big loss but it is not a death blow to us, as [Russian President Vladimir] Putin thinks." Mr Maskhadov, a former Soviet colonel, was branded a terrorist by Moscow for his involvement in the war in Chechnya. 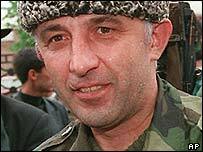 He led Chechen separatists who defeated Russian forces in a 1994-1996 war, and was elected Chechen president in January 1997. But he was ousted from power when Mr Putin sent Russian troops back into Chechnya in October 1999. He denied involvement in attacks by separatist guerrillas, including last year's Beslan school siege and the 2002 Moscow theatre seizure. Chechen warlord Shamil Basayev - Moscow's most wanted man - claimed responsibility for those attacks. Mr Maskhadov had repeatedly called for talks, and said just last week that all he needed to bring a peaceful end to the conflict was one "30-minute, fair, face-to-face dialogue" with President Putin. Moscow rejected his overtures, refusing to negotiate with what it described as wanted terrorists. Nikolai Patrushev, the head of Russia's internal security forces, the FSB, informed President Putin that Mr Maskhadov had been killed. The president called for further investigations into how Mr Maskhadov had died in the Chechen village of Tolstoy-Yurt, and pledged to honour Russian forces involved in the raid. Few details have been released of the Russian special forces operation near the Chechen capital, Grozny. Chechnya's Moscow-backed Deputy Prime Minister, Ramzan Kadyrov, told Interfax news agency the intention had been to take Mr Maskhadov alive, but he had been killed as a result of his bodyguards' carelessness in handling their weapons.